Was taught by Paul Tomița to play golf and knew him well before he died as I served at the American Embassy in Bucharest. Email me at xxxxxxxxx@msn.com Woul love to discuss what is happening with his golf course." I am delighted by your comment on my blog. Please reply with your name and contact information, and we can keep in touch. Just yesterday I made a golf date for 8 November, 2010, a week from today, and exactly two years after I first played at the Paul Tomiţa Golf Course in Pianu de Jos, Alba. We are only a twosome, so if you are in Romania, you certainly would be welcome to join us (two aging American professors). I am very pleased by your reply. My Father was the American Ambassador to Romania (1961-1965) and I was a teenager who learned golf from Paul (Tomița). I then returned to Romania as Commercial Attache (1994-1998) when I continued my relationship with Paul until his death in 2004. He was like a Father to me and I used to call him every month to catch up with him. He was a wonderful man who I loved very much. I am attaching a few pictures of Paul including one with King Michael whom he taught how to play golf. The first picture, was taken when I visited him in 2004 for two weeks. He died very soon after this picture was taken. He built several golf courses before the war and then was the Professional Golf teacher at the diplomatic golf course in Bucharest before he retired in 1975. Would love to share news about Paul and I am glad to hear that his golf course is being used and being kept up... at least I hipe it is. I know that he would be smiling in Heaven knowing that persons, especially young are learning golf and playing on his course. He truly lived for golf and loved teaching it and was always very sad that more Romanians had not learned the game. All the best. I am currently in Paris, but my wife will be in Timisoara from November 3-10. I am also attaching an article/obituary I wrote for the Washington Post upon his death. Also there is another article about Paul. Paul Tomita died on July 21, 2004 and was buried in Piana de Jos (Transylvania), Romania. Some in the Diplomatic Community in Washington, who have been to Romania may still remember Paul, "Professor de Golf" since he spent much of his life teaching golf to the Diplomatic and Business community from the mid 1930's to 1975 at the Diplomatic Club in Bucharest. After his retirement, he returned to Transylvania to the only place he knew where he could, "Play Golf, Hunt and Fish." 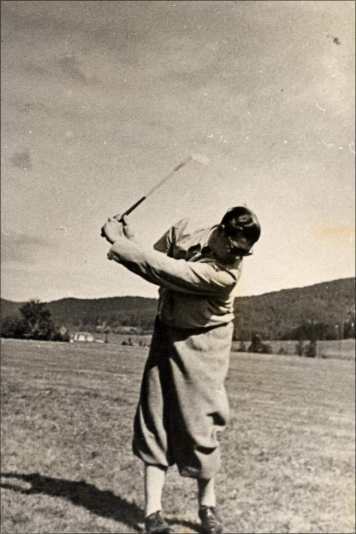 Paul learned golf from a French and then an English golf professional before earning his professional golf status in the United Kingdom and becoming the teacher to both King Carol II and Queen Marie of Romania. He grew up with Carol II's son, Mihai-later to become King Mihai I. They continued to keep in touch with King Mihai recently sending Paul a 90th birthday greeting. He survived, or better yet hoodwinked the Germans during WWII (Getting the Germans to get their tanks off his golf course) and the Communists for 50 years (finding ways to continue teaching golf despite their prejudice against golf). Age never seemed to slow him down and at age 75 with the end of Communism in 1990, he started building a nine hole golf course outside of Alba Julia. And there stands today a testament to his love of golf, the "Paul Tomita Golf Course". Paul loved Golf, he loved playing golf and teaching it and he wanted everyone else to also love the sport. The above picture was taken three weeks ago and those who know him will recognize the pipe in his hands as he loved his pipe almost as much as Golf, Hunting and Fishing. I will miss Paul as he had become my second Father, having taught me golf in the early sixties and later becoming my friend when stationed as Commercial Officer in Bucharest (1994-1998). We continued to correspond often by phone over the years and fortunately we were able to see each other fairly often; the last time was just three weeks ago when he taught me my last lesson of golf. He was a good friend to so many, including my wife and my son who saw him as his Grandfather. We will miss him but God will make sure that he can continue to play golf and smoke his pipe in the company of his wife and his friends. Bill Crawford, US Commercial Service, Washington, DC. This feature is based on Marius Petrescu's article, published in Romanian in Formula AS. I found the story particularly interesting, and I'm briefly retelling it in English here. To see pictures and the Formula AS article in Romanian, go here. In 1930s a teenager by the name of Pavel Tomita arrives in Bucharest, dressed in peasant attire: traditional white shirt, tight-fitting leggings and leather sandals. His brother, former bellboy and now administrator at Hotel Continental, introduces him to golf professor Jean Baptiste Lammaison, whom Prince Puiu Ghica invited to Romania to teach at the Country Club. Years afterwards, princes and high ranking officials learn golf from Pavel. In the elegant city, filled with fur coats, fancy hats and fine perfume, Pavel Tomita becomes Paul Tomitza and is courted by the high society of Greater Romania's capital. In winter, with the golf season over, he retreats to his Transylvanian town of Pianu de Jos. There he has family and a precious friend, church singer Mos Avram. In 1937 Paul is invited to England by professor J.T. Baker, who has just finished his contract at the Romanian Country Club in Bucharest. He receives his golf diploma from St Andrew's Professional Golf Association . . . and a Dunhill pipe. He is 23 years of age and not a smoker. 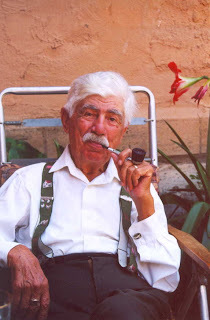 Since then, the Dunhill pipe he has received as a gift becomes his staple. At the 1972 World Cup in Australia, he meets Alfred Dunhill in person. Seeing that Pavel is using 35-year-old Dunhill pipe, Alfred Dunhill becomes Pavel's official sponsor for the rest of the latter's sports career. He's still thrilled to say that in 1938 he received his diploma from Lord Halifax himself, Britain's Foreign Secretary of State, with these words: "I am glad to meet, for the first time, a Romanian golf professor. You can pick your country. Congratulations!" Paul could now sign contracts between 800,000 and 1,000,000 dollars a year with numerous golf clubs in the world. He chose to return home -- and comments on it now: "He saw that I was silly, but he continued to act like a lord, respecting my choice." 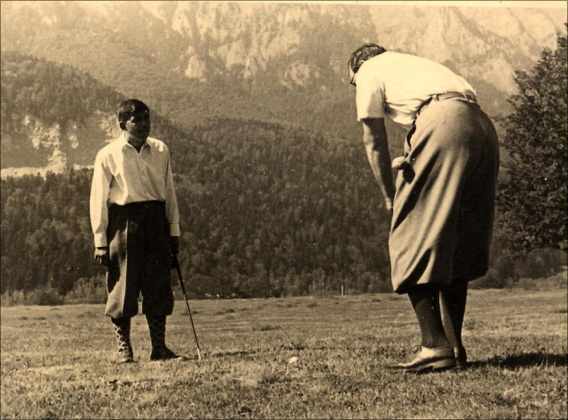 Back in Romania, he plays golf with Queen Marie, Carol II, and Carol II's 13-year-old son, Mihai -- later to become King Mihai I. Paul and Mihai spend all their weeks together until King Mihai I is forced to abdicate in December 1947, when the communists take over. The Country Club becomes now the Diplomatic Club, and the former gentlemen, comrades. The Secret Police has him arrested several times for not willing to become an informant. Given his entourage, he would have made the perfect spy. For 30 years Paul Tomita, as he comes to be called, is not allowed to leave the country. He makes it to the 1968 World Cup in Italy, when he's already in his fifties. He and his pipe are unseparable. In 1975 he retires, but the high society is still courting him, new ambassadors visiting him at Pianu de Jos for golf lessons, and former ones inviting him abroad. Up to 1989 he's traveling and teaching golf from his home in Pianu de Jos. People are asking him to intercede on their behalf and he's invited almost monthly to make his appearance in Bucharest. On the other hand, being the last golf professor behind the Iron Curtain, he's invited to leave the country every time he gets out for a tournament or visit. What means the world to him is the fact that he can be at his mother's bedside when she calls for him before passing away. After the elections of 1990, when the world of princes and gentlemen, as he knew them before WWII, is once again defeated, Paul Tomita forgets about Bucharest and sets off to build a golf club of his own. He's now the proud owner of Golf Club Paul Tomita. The gentlemen of yesterday have now all disappeared, except for King Mihai I, his old friend, whom he meets after 50 long years. They stare at each other, then hug each other. Almost oblivious of everything that has happened since they last parted, Paul welcomes King Mihai joyfully. To which the latter sadly retorts: "Our lives, mine and yours, have flown by, dear Paul." "The peasants have grown used to seeing him leaving with the golf bag to the golf. . . .They know that for him the most important things in life are God, Romania, his Mother, his Wife, his Pipe, Mos Avram and King Mihai. . . . The rest is silence." To see the accompanying pictures, see the Romanian article in Formula AS here. Nice to read all those great life stories about Paul Tomita!